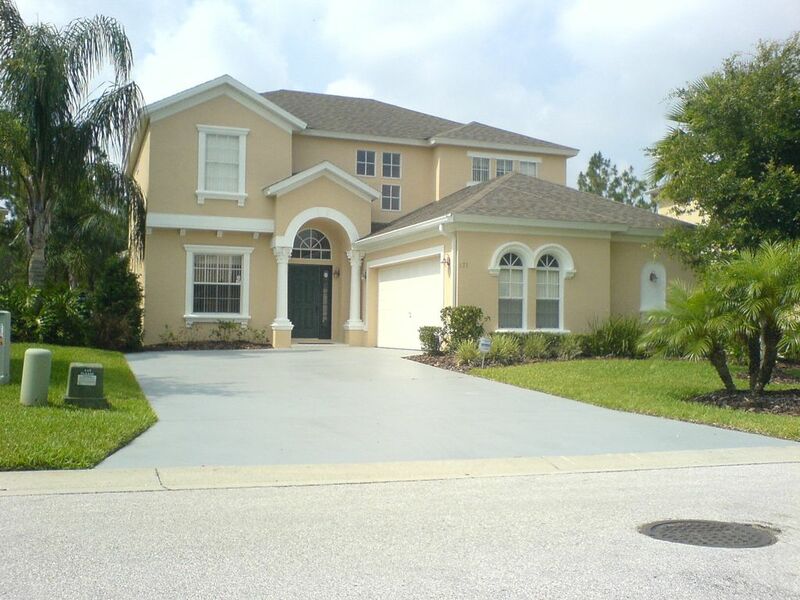 Enjoy one of the best rented houses in Orlando. A beautiful five bedroom, four and a half bathroom two floor villa just 15 minutes from DISNEY occupying a 10,000 sq foot plot. We have a stunning 1850 sq ft pool deck which has a huge 12 seat dining table and another 8 seat dining table plus gas BBQ and a Ping Pong table for your keep fit and sporty ones. Our gorgeous heated & illuminated swimming pool will cool you down after your relaxing hours in the glorious sunshine.Please note there is a small charge to heat the pool. With 4 1/2 bathrooms it is a pleasure getting ready to go out for the evening, no queuing in this house !!! We have converted our double garage to a great AIR CONDITIONED game room where we have a MASSIVE 9' x 5' CINEMA SCREEN with CEILING MOUNTED DIGITAL PROJECTOR, Dolby digital 5:1 sound system with Digital Cable. We have a DVD library of APPROX 75 free movies for your viewing including some of the latest blockbusters. We have subscribed to the digital sports package and HBO ON DEMAND so you have a great choice of channels to watch on our 9 foot screen or on our 52 inch LCD in the lounge. For those of you who have not experienced a home cinema with a 9 foot wide screen this will be a most enjoyable and memorable experience. It is quite simply awesome. We also have a Hi Definition Samsung TV in this room for the ultimate gaming experience, or just watching TV. The sports themed game room is 425 sq' and apart from our OUTRAGEOUS 9 FOOT CINEMA SCREEN,it also has a full-size professional pool table, electronic dart board, (great fun and safe) Samsung Hi Definition TV, Video, DVD, X BOX ONE, 3 massive bean bags and sofa to relax whilst watching movies. PLEASE NOTE UNLIKE MOST OTHER VILLAS OUR GAME ROOM IS AIR CONDITIONED WHICH IS VITAL. Many owners who covert their garage to a game room do not install AC and it is unbearable without A/C especially in the hotter months. YOU HAVE BEEN WARNED. UK CLIENTS CAN WATCH THE ENGLISH PREMIERSHIP GAMES ON OUR MASSIVE 9 FOOT WIDE SCREEN. Just wait til you see the kids faces, (and the dads)!!! When they enter this room. The game room is the ideal place for the kids to play after your hard day at the theme parks.If however, they are still hyperactive and want to play and splash about in the gorgeous heated pool you can sunbathe on the luxurious loungers and ..not get soaked...unlike most other villa's which have no room around the pool. This is one of the main benefits of having a massive pool deck. Calabay Parc is one of nicest rental neighborhoods in Orlando and is your perfect holiday choice. Our house is very special and provides fantastic facilities for your well earned break. Our south facing pool means you have sun all day every day instead of only half the day with other facing pool decks. It is floodlit for evening entertaining and is surrounded by 21 exotic palm trees. A south facing pool deck with dining for 16 people!! Yes,..this is a big deck. Luxurious sunloungers are dotted all around the deck. A gas barbecue is free for your use. The lounge, master bedroom #1 and breakfast area all have access to the pool. The master bed has a safe for valuables. The lounge has a brand new massive 52 inch FULL 1080 Hi Definition flat screen LCD TV. There are two master en suites with two of the other three bedrooms having private access to the third bathroom. The fourth bathroom is situated next to the fifth bedroom. The bedroom set up is as follows. There are beds to sleep 10 guests. There are TV's in all the bedrooms. There is TV, DVD, Computer Printer and Hi-FI in the lounge. The eight seat dining area is situated at the front of the house, facing the gardens,for more formal dining. You will find if very difficult to find a home which offers so much outdoor space and facilities. When you book you will be asked to place a $500 USD deposit to secure the home for your requested dates.This will constitute a binding agreement between both parties.The balance will be payable 12 weeks prior to arrival. ONE OTHER MAJOR PLUS, You do not have the hassle of going to a management company office to wait in a queue to collect keys and then again at the end of your vacation to return them which can add 2 hours onto your journey. WE HAVE A DIGITAL LOCK AND YOU WILL BE GIVEN AN ACCESS CODE MEANING EVERY GUEST CAN COME AND GO AS THEY PLEASE WITH NO WORRY ABOUT WHO HAS THE KEYS. Myself Ian and my wife Sheena originate from Glasgow, Scotland and moved to Northumberland near Newcastle Upon Tyne in Northern England some 29 years ago. We live in a little ancient Market town called Morpeth. We have two children Fraser 27 and Nikki 25. We love travelling and Florida is our favourite destination. We use our beautiful villa 3 times per year and we get so much pleasure sharing it with our very valued clients. We take great pride in offering a home with so many great features and during every visit we carry out many upgrades to keep our home very desirable and in tip top condition. Calabay Parc for us was the best location overall that we could find.It is convenient for all the theme park's with Disney only 15 minutes drive away.There are plenty of shops, supermarkets, Bars, Restuarants, and Golf Courses only minutes away. With interstate 4 only 2 minutes away you are perfectly located for the scenic 45 minute drive to the beaches. Having stayed at many villa's prior to buying our own, we put together a list of negatives which when buying our own property we could refer to and make sure we eliminated them at the building stage of our own home. The main issues with other properties we rented were as follows. Not enough bathrooms, not enough pool deck space to have lunch,dinner and also to entertain. With other small pool decks when we were sunbathing and the kids were splashing about in the pool,we got wet. We doubled the size of our pool deck to include a 12 seat dining table a separate 8 seat dining table. There is a further 4 seat table which can be used to provide a prep area for you BBQ food. The Ping Pong Table on the pool deck provides great fun for all the family. I have not seen another pool deck that offers so much space. It is vital that the pool deck is south facing (as ours is) as that is the only way you will get sun on the deck from dawn to dusk. Throw in the 20 exotic palm trees surrounding the pool deck and you have a unique setting. Having a cinema system at home in England we knew that this always produced the WOW factor with our friends when they visited. We decided that this would be a great idea for the villa and our massive 9 FOOT WIDE SCREEN has probably has been the best investment we have made. With over 75 FREE DVD's to watch you are spoiled for choice.This along with the game room pool table and ping pong table on the pool deck means the kids are never bored and are not in your face after a long day at the parks. The villa has so much space you are sure to have a relaxing vacation. We have two independent air con systems. This allows you to control the temp for each floor. Experience our sensational 9 foot cinema screen where you can watch digital cable TV or your favourite DVD's from our FREE library of over 75 movies. Several console games free for your use or bring your own. Enjoy our massive floodlit 1850 sq ft pool deck where 12 people can lunch or have evening dinner. You can also play darts on the deck and also use our new casino poker/ card table in the covered lanai area. Smoking allowed only on pool deck. Location, location, location ... Perfect! We stayed in Ian’s home 2/22/209 - 4/6/2019. 6 wonderful weeks. Ian is very easy to work with, we were able to reach him quickly when we had questions. The house has a well equipped kitchen, it even has a Keurig. The pots and pans, the cooking utensils, and the tableware were in very good condition. The bedrooms are spacious and there were extra bed linens galore. All those bathrooms made getting ready to go out stress free. Plenty of hot water ... at one point we had 4 people simultaneously showering. The huge screen in the game room was a real hit. It was a whole new experience watching the March Madness games. The pool area is very big, as can be seen in the photos. More than enough seating. We enjoyed this place a lot over our one month stay. Owner was great to deal with! Willy thank you so much for you 5 star review. I am glad you had a great stay and the house catered for all your needs during your full one month stay. You were brilliant to work with and you looked after our home as if it were your own and for that we are very grateful. I do hope we can see you again in the future. What you see is what you get. The house has plenty of room for everyone. The pool and deck are great to enjoy the outdoors, and it is very close to Disney and other stores and restaurant. Thank you. Nancy thank you so much for your nice review. It is great to hear you enjoyed the house and its facilities especially our huge pool deck area which is a huge hit with our guests and yes we are perfectly placed for Disney World and all the other parks in the Disney area. You were super to work with from the outset and our management team informed us that you treated the house with the utmost respect (unlike a recent family) and for that I thank you humbly. It would be great to have you stay again in the future. House is the worst I have ever stayed in. The upstairs bathrooms were not very clean and there appeared to be vomit stains on the carpet in master bedroom upstairs. All the air vents were very dirty and house smells musty, and left all of our clean clothes musty and had to rewash every single item after getting home. The furniture in living room is old and worn out and feels like you are almost sitting on the floor and furniture in game room is worn out as well.. Ping pong table is old and worn and every paddle was unusable. The pool table is worn and pool cues were worn with no tips on most of them. The double beds in upstairs bedroom are so worn you will sink in the middle. House was very dirty looking on outside, looked like mold. I would not stay here again and am glad we were out at amusement parks and beach for most of our stay. Be aware that owner uses offshore account and is not disclosed anywhere and you may be charged extra fees by your bank - I was. Only positive thing I can say, is that the price was cheap, but then you get what you pay for. I would not recommend to friends or family. This is not my first rental stay as I travel every year, but by far the worst. Let me 1st of all respond by quoting an old saying. Attack is the best form of defense. I got a disturbing e mail whilst on vacation from my honest and very loyal family management team husband and wife Ingrid and Byron whom have been with me for over 10 years. The e mail came in half an hour after this guest departed my home. They reported, with photographic evidence, that the guest who had occupied the upstairs master bedroom had vomited on the carpet and a crude attempt was made to clean it up. Now here is the absolutely DISGUSTING VILE part. They were smoking in the house which is absolutely forbidden. There were discarded cigarette butts on the floor of 2 rooms. Once again photographic evidence is held. The response of the guest. “Yes there were smokers but they smoked outside so the butts must have fallen out of their pockets onto the floor”. Does my head look like it buttons up the back. What kind of persons keeps stinking cigarette butts in their pockets. Absolutely disgusting. Ingrid says the 2 rooms stank of cigarette smoke and we had to get them fumigated prior to the next guests arrival and get the carpet steam cleaned. All at my cost. She also says that I have an overseas bank account and that hidden charges may be applied. FALSE LIES. My bank account is in Orlando and VRBO deposit all rental income into that bank. Any additional charges over and above the rental comes from either your credit card company and VRBO or both. Slanderous lies. What annoys me more than anything is that these guests took advantage of a last-minute offer and got a very low rate. Well you know what, if you charge 2 STAR RATES, YOU GET 2 STAR GUESTS. I don’t take a security deposit off my clients as a show of trust. This guest has shown complete disrespect to me, my wife, Ingrid and Byron my managers and all other honest and respectful guests who have looked after my property while staying.I hope this review will be seen as a malicious attempt to cause me damage because they have been found out, simple as that. HOW DARE I HAVE THE AUDACITY TO CONFRONT THEM. Really impressive property that is very well placed for shopping and getting around. Walmart is around 10 mins drive, there are local places to eat, for example Denny’s is no more than 10 mins away. It’s only about 10 mins from the I4 with its links to Disney and Universal. We all really enjoyed our stay here, particularly the barbecue and pool area which is very spacious and a sun spot, and the indoor cinema was fun for all. We enjoyed the space the home gave us and each had a bathroom, so very convenient. We all agreed that we wouldn’t hesitate in booking again. Thank you very much. The location is excellent and in a very nice community. It's close to the major attractions and the I4 for getting around. For us it was a central base to get to the golf courses and also for our children to get to the parks. The villa is very roomy, the outside area is a very good size, the lanai is very roomy and when we got hit by tropical storm Alberto we were all able to sit in comfort in the dry. We had a couple of small issues which Ingrid and Byron dealt with very well and when the wind tore a net panel after contacting Ian it was handled very speedily. Other than sleeping and preparing food in the kitchen we didn't spend a lot of time indoors preferring the outside warmth that we don't get at home, however I'm sure the cinema room would be good for those that enjoy films etc. Stays less than 5 nights may be considered if available on the calendar as a stand alone block or if the dates are very imminent. A cleaning fee of $120 applies for bookings 5 nights or less. If the dates requested are within 2 calendar months to arrival full payment is required at the booking stage. Our full rental terms and conditions are available upon request inc our cancellation policy. Pool heating is available for $25 per night.